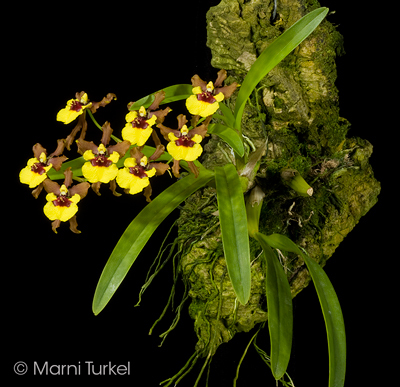 Oncidium croesus outcross #1886 ('5901' x 'Dan') (approximately 25 seedlings per flask). 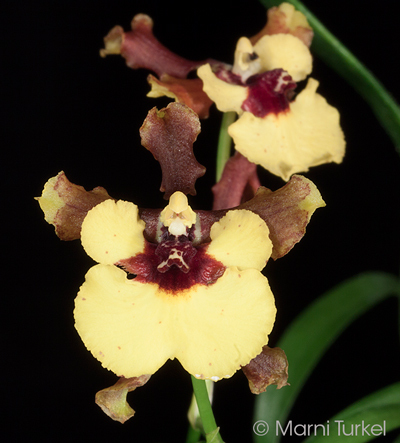 The Species: This plant is from the coastal mountains of Brazil at elevations between 1325 and 2000 ft. The mature height is under 5". It blooms with 3 to 5 very long-lasting flowers per spike that are about 1 to 1.25" wide. The spikes come from the not yet mature growths. This species is lightly fragrant when you get close to the flower. Culture: I have grown this species both mounted and potted. It does well in intermediate to cool conditions and prefers a slightly drier (but not severely dry) winter. It is also recommended as a warm grower but I haven't tried that. Moderate light, water as it approaches dryness and regular fertilizer during the growing season. 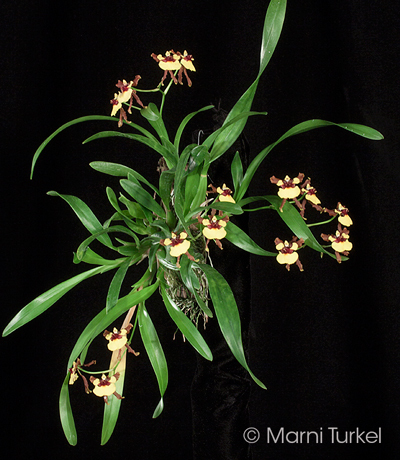 Oncidium croesus. Blooming images show the growth habit of the species.